Never fails when I go home, I see a ton of wildlife that I wouldn’t normally see in the city. I was all cozy in bed on Saturday and groggy as I took a quick look out the window to see if we were getting any snow. 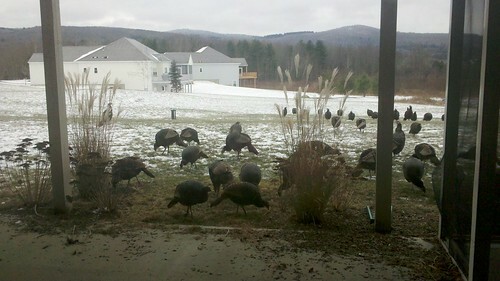 Instead, I see about a dozen wild turkeys. I call upstairs to my parents to tell them to look out the window. As I do this, more and more come running. My mother had a bird feeder hanging up and a bunch of seeds fall to the ground. 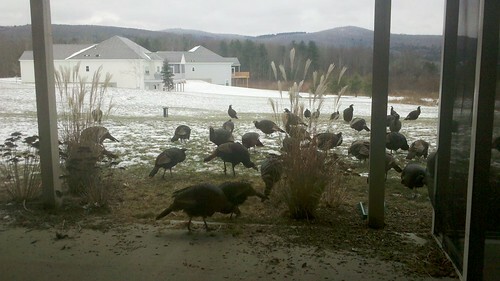 I guess the turkeys decided that they’d partake in the feasting. I was trying to get a sense of how big they were. Could make a tasty dinner! Please excuse the “great” narration. I had just woken up and thought I was clever. Amazing, right? You can clearly see we had probably about 30 or more turkeys. If you look at the left side of the video, you can see like 10 at a time come running towards the house. It was insane. Here are some still photos of the craziness. Dr. Awesome and I got some great culinary tools as presents. We now have a mandolin with safety gloves and his mom got me a waffle pan and an immersion blender! Can’t wait to try out these puppies! Vanilla waffles sound like they’ll be happening very soon. We’re heading to Virginia to visit some friends for new years. We’ll be eating some good food and visiting some vineyards. I’ll be taking lots of photos and drinking lots of wine. Very excited! Never had wine from Virginia before. It’s going to be a great time with great friends and fantastic fooding. ~ by Rori on December 28, 2010.